Makes 3 servings. My boyfriend hates it when I make healthy things and even he loves this! Instructions: Add everything into a large jar and shake really really well. Make sure the syrup/honey isn’t all stuck on the bottom. 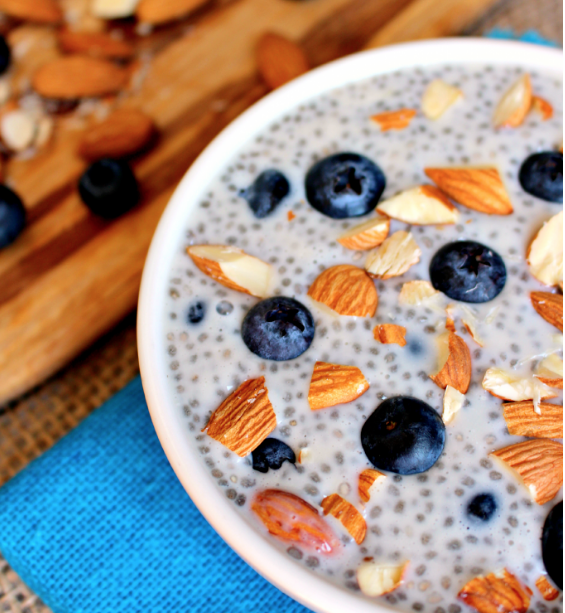 Refrigerate overnight until the chia seeds soak up some of the liquid and it has a pudding like consistency. I like to eat this with some fresh berries and a little toasted coconut on top. Sometimes I add cocoa powder or chocolate protein powder to the mix to make it more like chocolate pudding. This recipe is one of my favorites for a fast dinner; (sorry the site is annoying and has music) I usually just cook some brown rice to serve with this and saute some asparagus or green beans to put on the side. I love these, you could skip adding chocolate chips in them to make them healthier. I use all different nut butters or sunflower seed butter, sometimes I put raisins in instead and I often add some protein powder to the mix. They’re super easy and I fill mason jars with them and snack on them after working out. This one is vegan in case people are interested in that. . One warning, I literally double every spice she calls for when I make these and then add a few other things too. I like FLAVOR. Mindset Part III: Choice & Decision - They are not the same thing!